Dr. Wages is an Associate Professor in the Division of Translational Research & Applied Statistics in the Department of Public Health Sciences. 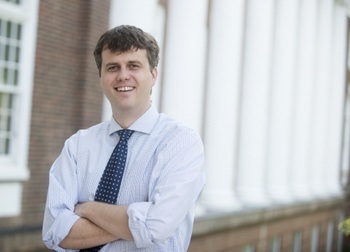 He is also an active member of the UVA Cancer Center Biostatistics Shared Resource. Dr. Wages is part of a national research effort to change the way early-phase clinical trials in oncology are done, not only through the pursuit of novel statistical methods, but also by focusing on successful implementation of developed methods into real studies. He collaborates with cancer center members in tailoring clinical trial designs to meet contemporary research objectives in early drug development. Design, monitoring, and analysis of early-phase clinical trials in oncology. NCI Investigational Drug Steering Committee Clinical Trial Design Task Force. Faculty member, ASCO/AACR Methods in Clinical Cancer Research Workshop; Vail, CO.
Conquer Cancer Foundation Grants Selection Committee, Young Investigator Award Panel, ASCO. Extended model-based designs for complex Phase I clinical trials in oncology. Hobbs B, Barata P, Kanjanapan Y, Paller C, Perlmutter J, Pond GR, Prowell T, Rubin E, Seymour L, Wages NA, Yap T, Feltquate D, Garrett-Mayer E, Grossman W, Hong D, Ivy P, Siu L, Reeves S, Rosner G. Seamless designs: current practice and considerations for early phase drug development in oncology. Journal of the National Cancer Institute 2019; 111: 118-28. PMID: 30561713. Wages NA, Chiuzan C, Panageas KS. Design considerations for early-phase clinical trials of immune-oncology agents. Journal for Immunotherapy of Cancer 2018; 6: 81. PMCID: PMC6103998. Wages NA, Portell CA, Williams ME, Conaway MR, Petroni GR. Implementation of a model-based design in a phase 1b study of combined targeted agents. Clinical Cancer Research 2017; 23: 7158-64. PMCID: PMC5712236. Wages NA, Slingluff CL, Jr, Petroni GR. Statistical controversies in clinical research. early-phase adaptive design for combination immunotherapies. Annals of Oncology 2017; 35: 696-701. PMID: 28011450. Wages NA, Conaway MR, O’Quigley J. Continual reassessment method for partial ordering. Biometrics 2011; 67: 1555-63. PMCID: PMC3141101.